From April to Sept, this Sri Lanka Cultural Triangle & wildlife holiday combines a safari to see leopards at Wilpattu, with the elephants of Minneria & whale watching in Trincomalee. Visit Temple of Tooth in Kandy, Anuradhapura, Dambula Cave Temple & Sigiriya Rock, then relax on a beautiful beach & snorkel at Pigeon Island. English speaking guide, all transfers, game drives & sightseeing included. This morning your driver/guide will collect you from your Colombo hotel and introduce you to the beauty of Sri Lanka as we travel 3-hours to the bustling hill capital of Kandy. We also make a short stop at a Tea Factory to see how the leaves of the tea bushes are dried, to make one of the most popular drinks in the world. On arrival in Kandy, check into your hotel in this religious and ancient capital of kings. Today we visit the sacred Temple of the Tooth, that houses a tooth relic of the Buddha. Religious pooja ceremonies, when the golden casket containing the tooth is revealed, are held daily at 05.00, 09.30 and 18.30 - so this is the best time to visit. Afterwards we visit the beautiful Peradeniya Botanical Gardens. Dating back to colonial times, this magnificant property has abundant bird life, including a bat colony. It also has a rare collection of indigenous tropical flora, including an Orchid House. We suggest you ask your hotel to pack a picnic today, so that you can enjoy it in these gardens. The balance of your afternoon is free to explore more of Kandy on foot and in the evening enjoy a Cultural Show, with dancing and fire walking. We leave Kandy this morning and travel 2.5-hours into the Cultural Triangle. At Dambulla we explore the famous Golden Rock Cave Temple - a sacred Buddhist pilgrimage site for 22 centuries. This vast isolated rock mass with five caverns filled with statues is the largest and best preserved cave monastery in Sri Lanka. We also visit a Spice Garden, before checking into our hotel in the heart of this historic region. This morning we travel 2-hours to the ancient and sacred city of Anuradhapura - founded in the 4th century BC and now a World Heritage site. Along the way we stop to view the famous Avukana Buddha statue, carved out of a large granite rock face during the 5th century. Standing at over 40 feet (12 m), it is the tallest and most magnificent undamaged ancient image in Sri Lanka. We continue to Anuradhapura and the ancient remains on the mountain peak of Mihintale. This is a pilgrimage site regarded as the cradle of Buddism in Sri Lanka, as it was here that the monk Mahinda met King Devanampiyatissa and introduced him to Buddhism. Check into your hotel in this capital of the north, surrounded by monastries and the well-preserved ruins of the great Sinhala civilisation. Today we drive 1-hour to Wilpattu National Park to explore its wildife, with morning and afternoon jeep safaris. 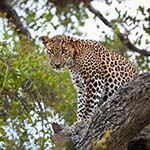 This national park is renowned for its leopards. Wilpattu is also home to 30 other animal species including water buffalo, elephant, sambhur, spotted deer, mongoose and Mugger crocodile. Sloth bears are also present but are rarely seen. Small mammals such as giant squirrels and flying foxes adorn the trees and peacocks are easily spotted. A unique feature of this national park is its many natural lakes, which results in abundant birdlife - including many water birds and raptors. This morning we explore the ruins and temples of ancient Anuradhapura, starting with a visit to the 'Sri Maha Bodhi' (the sacred Bo tree) which is over 2,200 years old and was grown from a branch of the tree under which the Buddha attained enlightenment – the oldest historically documented tree in the world. This city has the largest number of ancient monuments of the great Sinhala civilization. Here you will see some of the tallest "stupas" in Sri Lanka (Buddhist commemorative monuments consists of a circular base supporting a massive dome) as well as the ruins of ancient royal palaces. Afterwards we transfer 3-hours to the port city of Trincomalee with its natural deep-water harbour, which was mentioned in the travels of Marco Polo and has been an important sea port for Asian, Chinese, Dutch, French, English and Portuguese traders. Here you will be dropped off at your hotel on the warm east coast, with its beautiful Indian Ocean beaches. Note: As your Cinnamon Air return flight has an 18 kg baggage limit, your driver will take any excess luggage from you when he drops you off at your hotel and return these to you in Colombo. At leisure to relax on the unspoilt Indian Ocean beaches of Trincomalee. Trincomalee has been one of the main centres of Tamil culture for many centuries - including poetry, music and literature - and you can visit the ancient Koneswaram Rock Temple and other shrines. You can also visit the Dutch Fort, the largest in Sri Lanka and the British War Cemetery - as this large natural harbour was an important strategic naval base for British war ships during the Second World War. This morning enjoy a half day of snorkelling, with early collection from your hotel for the 20-minute boat ride to Pigeon Island. Situated off the coast of Nilaveli, Pigeon Island Marine Park offers some of the best snorkelling and diving among corals found anywhere in Sri Lanka. Visibility is at its best in the morning, but this is an ideal place to simply swim in the warm sea and enjoy a picnic lunch. Note: We suggest you bring your own mask and snorkel, as those on offer are well used. During the whale season (late March to early September) there is the option to rise early and transfer to Uppaveli Beach for a 3 to 4-hour Whale Watching boat ride on the warm Indian Ocean. You can hope to see Blue whales, Bryde´s whales, Sperm whales, Fin whales and sometimes Killer whales. The Common dolphin, Bottlenose dolphin, Spinner dolphin, Risso's dolphin and Striped dolphin are also seen in these clear waters and you may even see turtle, bluefin tuna and flying fish. Afterwards return to shore, with balance of day at leisure. Note: Wear a jacket as it can get cold on the boat and take a sun hat, sun glasses, sunscreen, camera & small towel. Take your own snacks & drinks. As you will be on the ocean waves for several hours, if you are not a good sailor remember to take preventative travel sickness tablets well in advance. Relax on the pristine white sandy beaches of Trincomalee and swimming in these warm shallow waters. Optional activities include diving and deep sea game fishing. Transfer to Trincomalee Airport for your light aircraft flight to Nayakakanda, north of Colombo. Here you will be met and transferred to your hotel situated near Colombo International Airport.